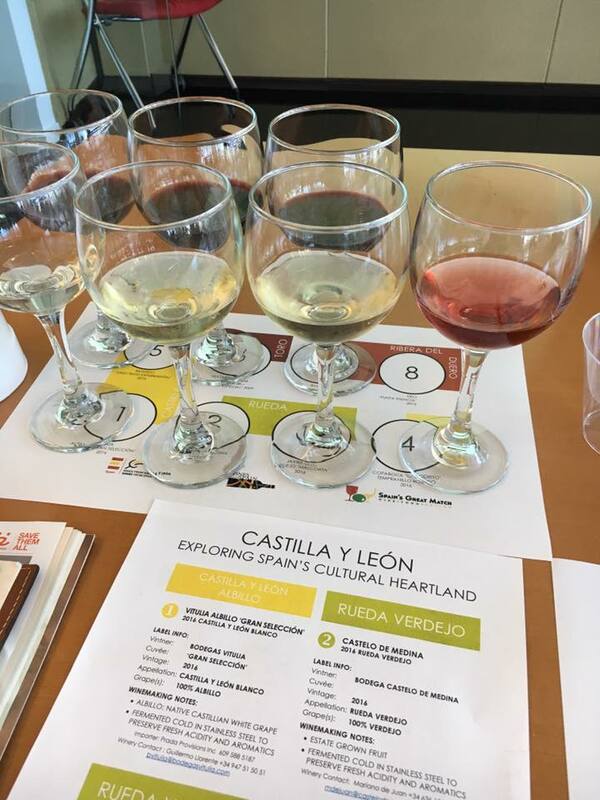 Every year I look forward to “Spain’s Great Match,” the day-long tasting, seminar and tradeshow in NYC meant to educate tradespeople on the great wines of Iberia, from Sherry to Bierzo to Cava. I don’t make it to the party every year, but thrilled that I could this year. It was a beautiful day in Manhattan, and although I couldn’t get into my friend Ana Fabiano’s Rioja class, I was able to sit in for two seminars – one on the Castilla Y Leon region, as well as one on Cava, Spain’s answer to the delicious wonders of Champagne. Each was hosted by Marnie Old, who packs an astonishing amount of information into an hour, and who talks fast enough that you’d better pay attention. Spain, like most other “major” and “historic” wine producing countries, is typified by a startling range of grape varieties, soil and climate types, vines on elevations from sea level to mountain, and a number of grapes and wines that are either unique, or the finest expression of that grape anywhere. As soon as we sat down, Marnie plunged into a faced-paced overview of the many facets of what she calls “Spain’s cultural Heartland.” The entire Castilla Y Leon region is described as a high plain encircled by mountains, which accounts for the vastly different ripening times of the grapes. There are hot summers with cold nights, and long cold winters. Castilla Y Leon is not just a wine region but also a defined, “politically powerful” region historically, actually an expansive autonomous community in the northwest. And it’s a big place. With nine named D.O.s – Denominación de Origen, it’s also an important wine region, with the most famous among them Ribera del Duero, the home of the Tempranillo grape. And its Bierzo region is home to two of my favorite grapes: Mencia, which makes a medium to full-bodied cherry, licorice and pomegranate-flavored red, and Godello, a lush and aromatic white that reminds me of Viognier. Vitulia Albillo Gran Seleccion Castilla Y Leon 2016 – Young and fresh with lemon and peach flavors but a really restrained nose, this is 100% Albillo Major, a native grape. The wine is fermented cold in stainless steel and also unoaked, which give it a characteristic sharpness. Low on the alcohol end, about 12.5%, and about $15 retail. Castelo de Medina Rueda Verdejo 2016 – 100% Verdejo. This one is 100% estate grown fruit, also fermented cold in stainless steel. But it has a big nose and big acidity, with sharp green apple flavors and reminiscent, to me, of a Sauvignon Blanc. 13% alcohol and about $15 retail. Javier Sanz ‘V Malcorta’ Rueda Verdejo – “Malcorta” means “bad cut,” shorthand for the fact that it’s tough to cut these clusters of Verdejo grapes off the vine. Produced on a large, 100 hectare property, it’s yet another white fermented cold in stainless steel. Javier Sanz was able to resurrect vineyards from the pre-Phylloxera days, the 1880s when the French and eventually much of Europe’s vineyards were ravaged by the grape louse. About 13% alcohol and $20-22. Finca Feroes Rosado 2015 – This juicy, Raspberry-laden wine is much darker and more intense than so many wimpy Rosés on American shelves today; it’s more like a very light red wine, after 36 hours of skin contact before the juice is drained off. A bit lower in acid than I’d like but has a punch at 14% alcohol. About $10-12. Bigardo Vino Tinto 2016 – Actually an “unclassified” wine from the Toro region, 100% Tinta De Toro which the winemaker swears is not Tempranillo, even though that’s an alternative native term for the grape. I think he refers to it as an “experimental” Tinto and it’s a blend of very small fermentations from individual vineyard blocs. Some might say this is reminiscent of a “Dago Red” with all its earthiness. I think this is just scrumptious wine from an iconoclast winemaker, 13.5% alcohol and about $25. Matarredonda ‘Libranza 28’ Toro Reserva 2009 – This flagship Reserva “Especial” wine is 100% Tinta De Toro made from estate-only fruit taken from ungrafted vines that average 70 years. Powerful with an almost liqueur-like aroma, aged for 28 months in French oak. 14.5% alcohol and about $28-30. Balbas Crianza Ribera Del Duero Crianza 2014 – This estate wine comes from a winery that was built in the 1770s. It punches you with brisk blackberry and blueberry flavors, also from old ungrafted vines and aged 18 months in French oak. 14% alcohol and about $40. Great Wine Books for Summer Reading!! next post: Spain Ups its Game on Sparkling Wine!